The Penhold style Yasaka Ma Lin Extra Offensive is assembled with Yasaka Mark V rubber with Max thickness sponge. THE PENHOLD BLADE: The Yasaka Ma Lin Extra Offensive blade is the blade used by 2008 Olympic Gold Medalist Ma Lin. It has a large sweet spot and excellent speed performance in attacks. Also excels in the important blocking play. THE RUBBER: The Mark V rubber from Yasaka is a classic allround offensive rubber, still one of our top-selling rubber sheets because of its versatility and performance. OVERALL: This blade/rubber combination is suited to employ a variety of offensive spin shots while maintaining excellent control. Recommended for a wide variety of allround to offensive players focused on controlled shots. I received this Paddle in the mail recently and was well amazed by the shipping time and the packing. 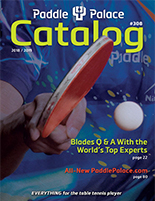 I also received a free catalog for all of my Table Tennis needs.Besides how the package came the paddle performs very well and is perfect for a pen hold player. You will be amazed by how well the ball moves when it fly's past your opponent.